The Huawei Honor is not the lightest device around at 140 g but it does remain quite manageable at 122 x 61 x 11 mm for a smartphone with a 4” screen. The weight of the handset actually adds a bit of substance – which is welcome considering the phone’s design desperately lacks character. The Huawei U8860 Honor is a reasonably sized 4-incher and the screen bezel is fairly thin – there isn’t much unused space. The metal frame surrounding the screen fails to add even the slightest bit of style. Even if it does, it gets drowned in the cheap gloss. Otherwise, it’s a very clean design, which may as well look better in some of the other paint jobs available. The main focus on the front is the 4" capacitive LCD of FWVGA (480 x 854) resolution. Technically, there’re enough pixels but the picture is somewhat dim. The overall poor Image quality and viewing angles make the display the weakest point of the device. Here are all the numbers - you can compare it against some of the best in the class that we've tested. Below the display you'll find four capacitive buttons for Home, Menu, Back and Search. They light up when touched but otherwise stay out of the way for the most part. Above the display there's the usual earpiece, along with a secondary VGA camera and a proximity sensor to disable the display during calls. A tiny status LED is in the top right corner. 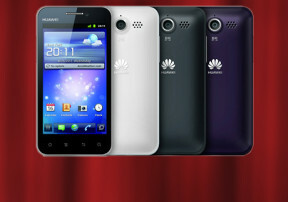 The left side of the Honor U8860 features the volume rocker, while the right side of the phone is free of any controls. The bottom of the phone holds the MicroUSB port for data connections and charging. On either side of the port you get the mouthpiece and a tiny slit for lifting the battery cover. The power/lock button of the Huawei Honor is placed at the top and next to it is a 3.5 mm headphone jack. What we particularly disliked about the Honor is the back panel. It's black and glossy and very easily gets smudges all over, which are in turn almost impossible to get rid of. You'll find the 8 MP camera lens on the back, with a single LED flash and a loudspeaker grill on either side. The Huawei logo is stamped below them in white. Removing the glossy back panel reveals the insides of the Huawei U8860 Honor and the big 1900 mAh Li-Po battery. Our unit had a battery with 1880-1930mAh range. Hidden under the battery are the SIM card and microSD card compartments, which can only be accessed with the battery removed. Huawei are keen to make a point about the Honor's powerful battery. There’s still a dedicated Power saving mode in the settings. It will disable Bluetooth and Wi-Fi, switch off UI animations and haptics, and set the screen brightness to the lowest possible value. Display timeout is set to 15 seconds while background connections and mobile data are turned off. We generally don’t mind the plain design but the gloss is just too much for our taste. That said, some of the alternative color versions may fare better. We’ve no complaints about the general ergonomics and build. We just wonder whether the plastic just feels cheap or actually is. To be honest, there seem to be no major weak spots to warn against except perhaps the low display image quality. The phone is easily pocketable and simple to operate single-handedly, which is a plus considering you get a 4” screen.